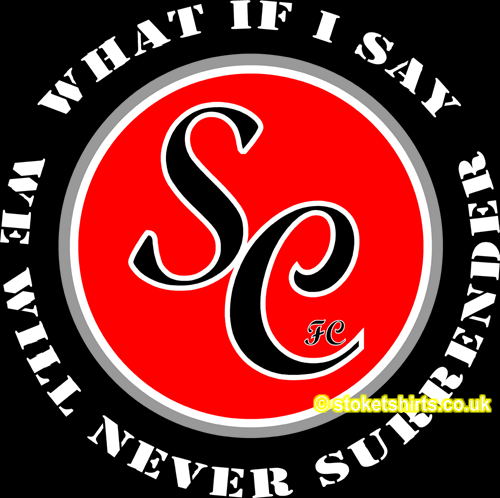 What do you get when you cross a t shirt designer with a Turkish International footballing legend, a marxist revolutionary and a former University of East London student who had a UK Number one single in 2009? 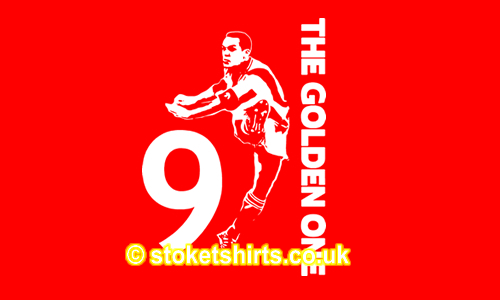 A bizarre mix of t shirt designs, that’s what! From Che Guevara to Tinchy Stryder, could our influences be wider?? Che Guevara at the La Coubre memorial service. Taken by Alberto Korda on March 5, 1960. Jack is pictured on the front of “She Stood There Laughing” and has since gone on to achieve fame in his own right through his music management career. 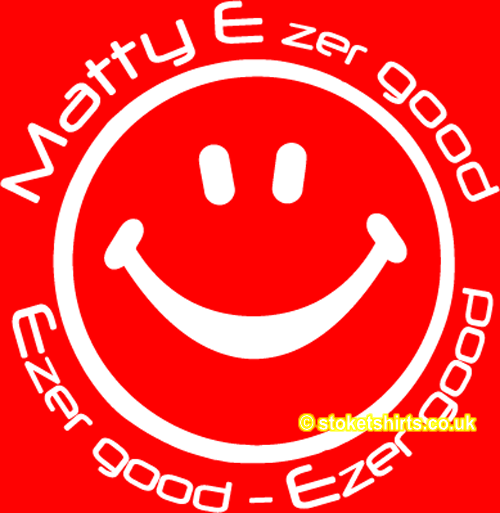 His company is called “Takeover Entertainment” and he is co – manager of Tinchy Stryder. 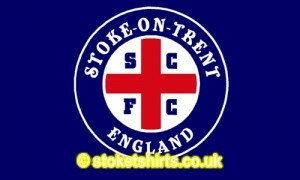 Not bad for a Stokie living in Norwich! Welcome to our second newsletter/ product update. We have an amazing Fourteen new designs (although three have these have already been released – Austria Tour x 2 and Fortress). 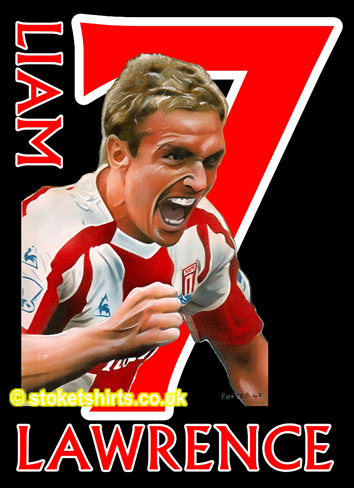 We also have the launch of the Potter 63 artwork and t shirt range featuring fantastic airbrush paintings of Liam and Beats. 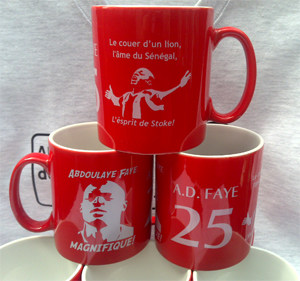 The Abdoulaye L’Esprit Mug has been our fastest selling yet so don’t miss out. 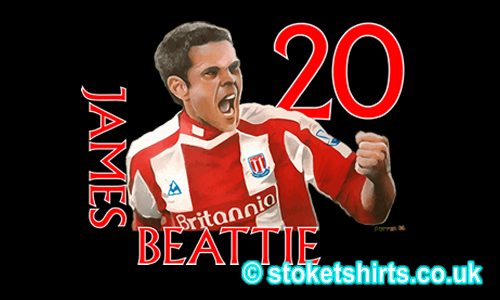 We also have a Fantasy Football League Competition (with a Stoke City Twist) that is free to enter and prizes can be won, news of our website updates and “what else” we have been up to. 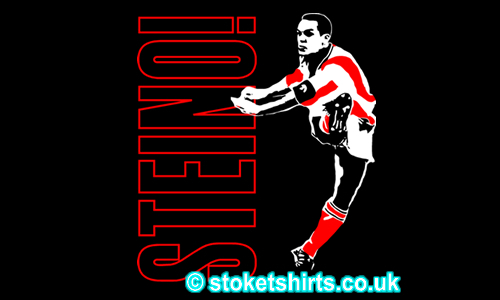 It’s still great T shirt weather so why not treat yourself to one of these great designs? media. 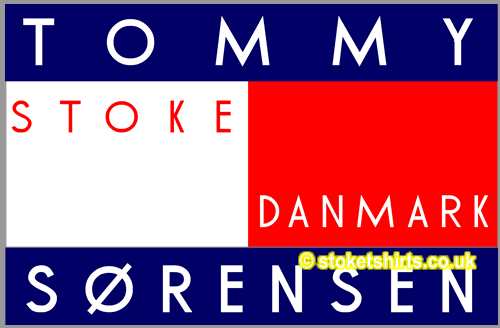 Please click the image to see the higher quality version. fantastic on all colours. 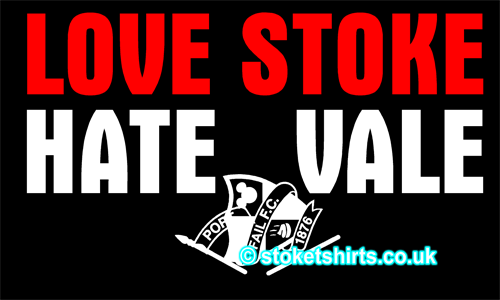 Wear this with pride. 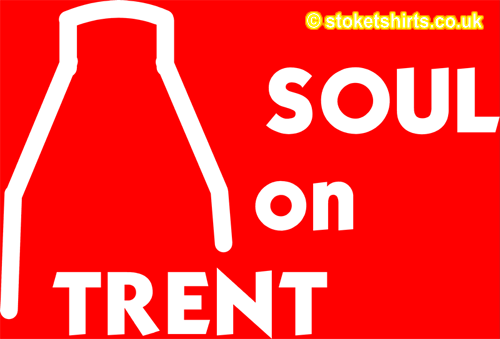 May not mean much at first glance but put it into GPS SatNav and it will guide you to the best place on Earth, The Britannia Stadium. 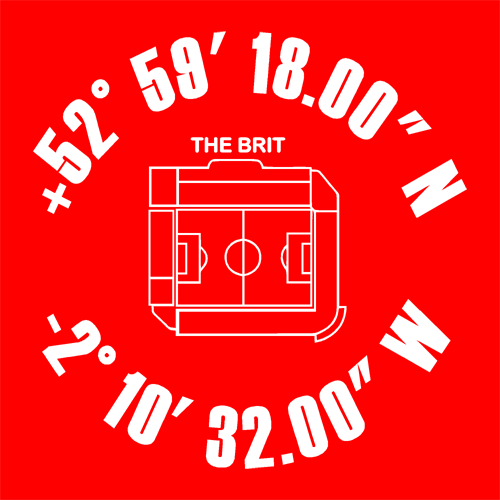 These are wrapped around our Brit Plan to make a striking design. A nod to our history and how our year of formation may have been displayed at the time. 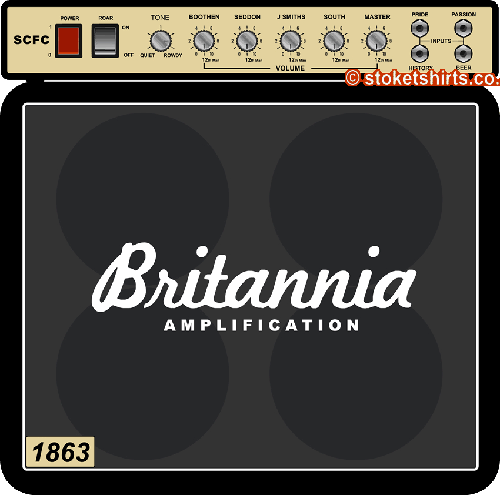 MDCCCLXIII is of course the Roman Numerals for 1863.
the Brit. unless wearing this notice and ear defenders. 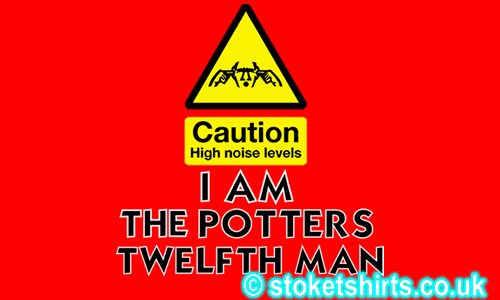 Caution High Noise Levels – I AM THE POTTERS TWELFTH MAN. There is no Theory of Evolution. 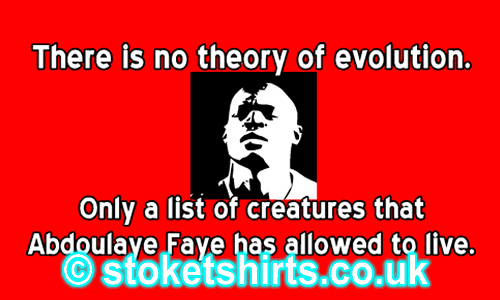 Only a list of creatures that Abdoulaye Faye has allowed to live. 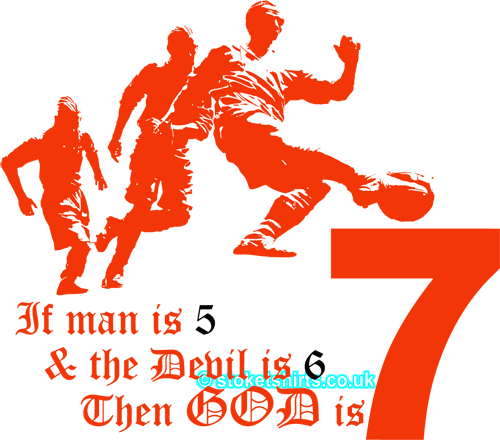 their manc. 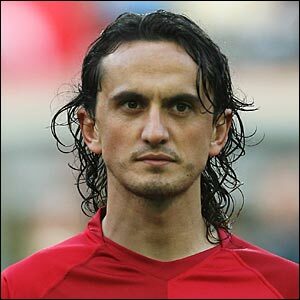 roots. 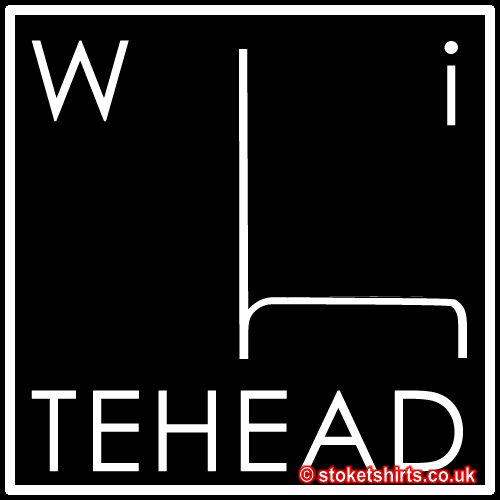 This is a classic design further improved by including two of the most important words in the English language. As that famous son of Ireland, Father Jack (from Father Ted) says “Feck the Media”. 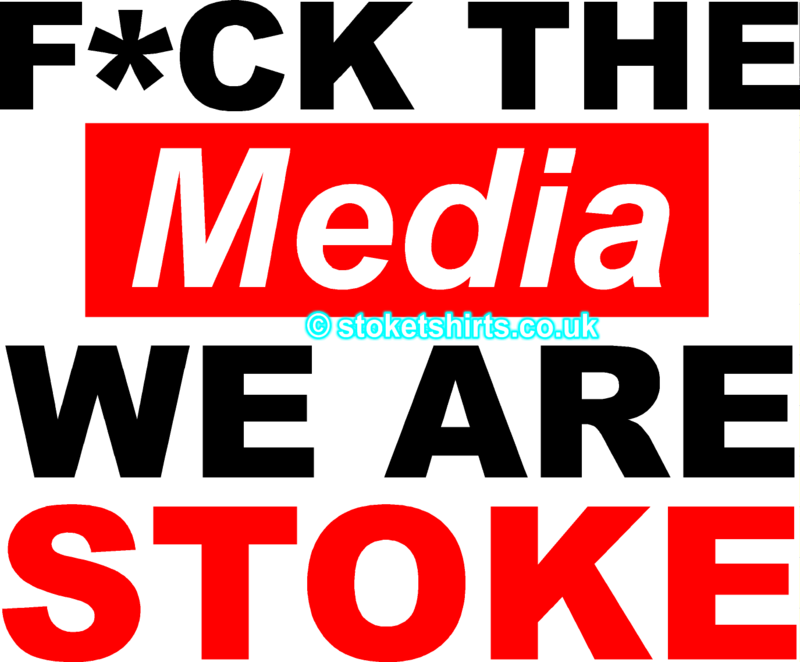 Okay he probably didn’t say “the media”, or our shirt doesn’t mean Feck. 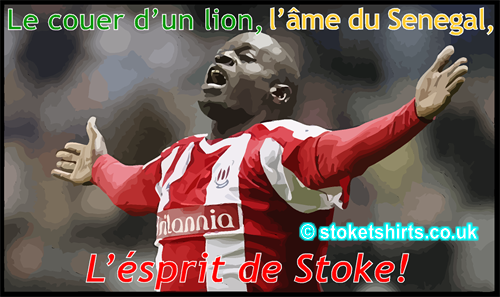 We are Stoke and no matter what anyone says we work hard, play hard and get results. F*ck ’em. 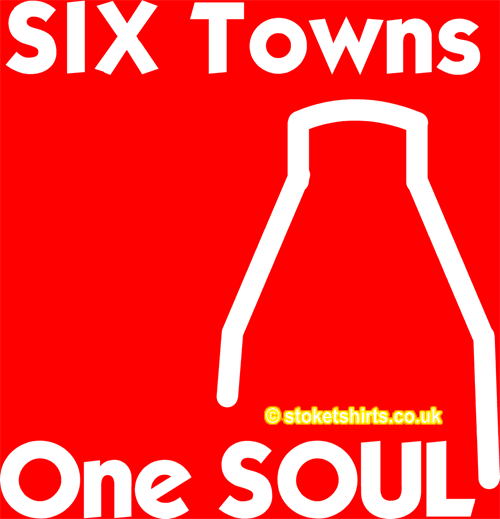 are the Kiln image will remind of where your heart is. 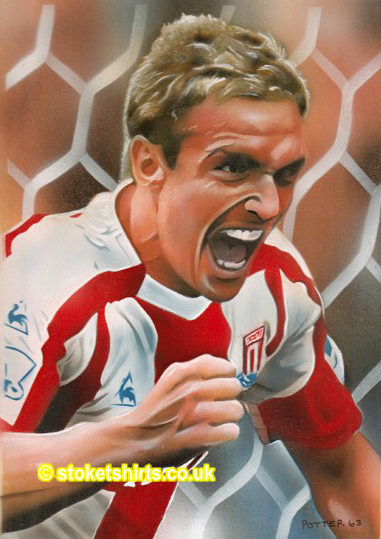 As Liam signs a 4 year extension to his contract we have tweaked Potter 63’s wonderful painting of Lenny celebrating notching our first Premier League goal. Keep the dog away this season Liam. 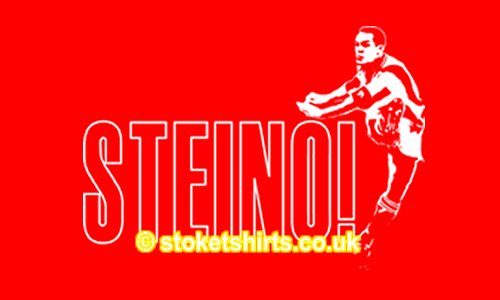 it the Stoketshirts treatment and added his name and squad number. The Sound of Austria 2009! Remember Julie Andrews in the Sound of Music? For Julie read Liam. 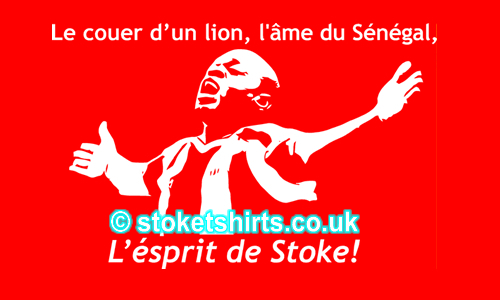 Well this year the Alps will be ringing to the Sound of Stokies! Yes, it’s pre-season time again! July is here and once again Tony and the lads are off to the land of the Schnitzel for another gruelling week of ‘aard work in the mountains. 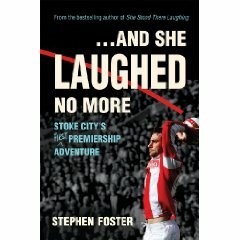 “The Britannia is packed to the rafters…”- the first line of Ian Dyer’s stirring tribute to the fantastic matchday atmosphere of the Brit – “Fortress”. 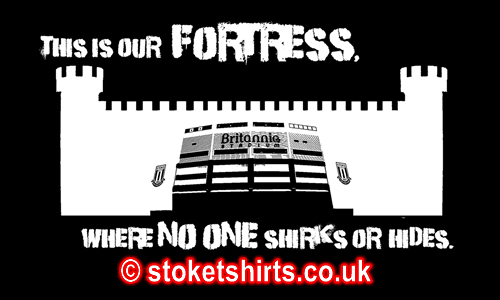 Inspired by the imagery of Ian’s Poem we created our own take on “Fortress Britannia”. A hybrid Stadium entrance/castle wall to represent the fortress mentality that will no doubt welcome opposition teams and fans for many a season and embellished with the phrase “This is our Fortress – where no one shirks or hides”. search of the sun with a Stoketshirts T shirt in their case. 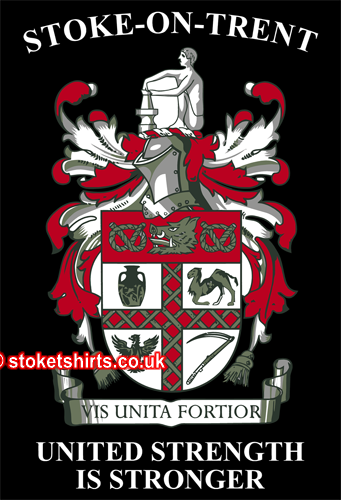 Thought like “where’s that internet cafe when you need it?” “Is that text from my mate a windup or can we really get him in a Stoke shirt?” Is “Davesviews” just a front for all internet cafe owners to make a few quid?” Isn’t summer great. Tone won’t let us down and will get the right players who possess the “right DNA.” In Tony we trust. that it ooh so easy to communicate (If only) this year. webstore. 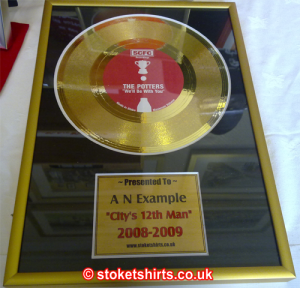 These will make a great centre piece on any wall. We have 3 options of prints to choose from. There is also a wide selection of sizes. and can be framed by yourself. We had a great piece in the business section local newspaper that featured our shirts. Tony Says Mugs and amazingly No. 100 went for £26. 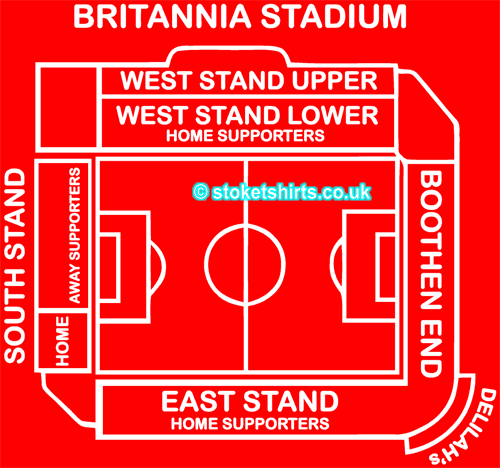 We have raised over £70 for the Donna Louise by doing this thanks to your generosity. 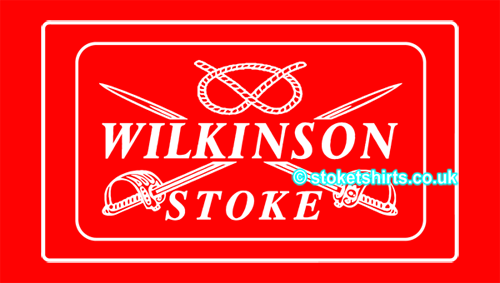 It’s Holiday season and it’s always great to see a fellow Stokie strolling along the prom wearing a Stoke T Shirt, whether it be Cyprus, Salou, Rio or Rhyl. Be Loyal, Be Proud, Be Seen wearing a Stoke T Shirt. 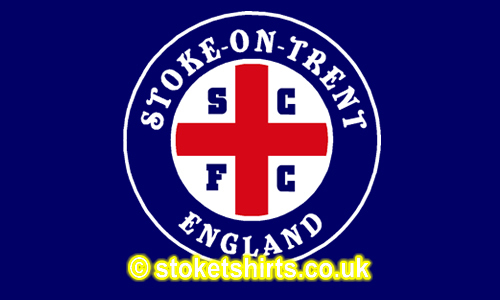 Don’t forget to take your photo wearing it and send it in to us to add to our “show us your shirts” page. 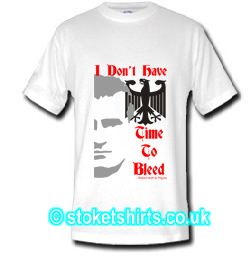 Make your holiday complete and buy oneof our fantastic designs! Have a good one! will get back to you when I can. The Prizes will be a t shirt and hoodie of your choice to the winner with a t shirt to the runner up. Good Luck. 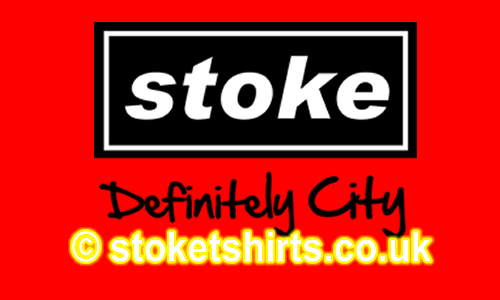 Our mailing address is: Stoketshirts.co.uk, P.O. 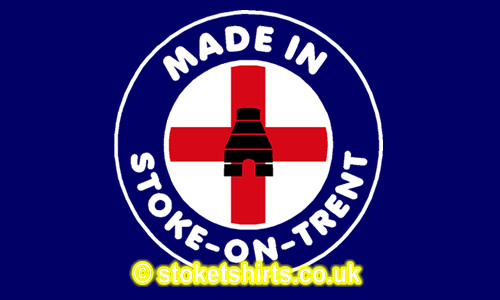 Box 1863, Stoke – on – Trent, Staffordshire, ST4 9GZCopyright © 2009 stoketshirts.co.uk All rights reserved.